Pineapple juice is excellent when used as a marinade. In fact, the pineapple's bromelain enzyme is so powerful in breaking down tissue that those who work with the fresh fruit in the fields and canneries must wear gloves to protect their skin. The juice not only tenderizes tough meats but also adds a taste of the tropics to recipes. 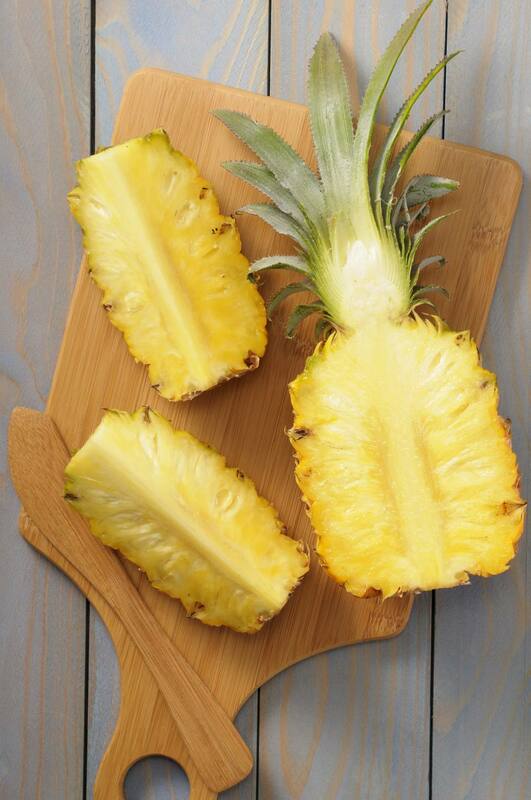 The same bromelain enzyme in fresh pineapple will cause gelatins to fail to firm up and dairy products to separate. Cooking nullifies the enzyme, so use canned instead of fresh pineapple in your gelatin molds. Pineapple juice is also an excellent choice as an acidulator to keep other products from oxidizing and turning brown, but use canned rather than fresh so it will not soften the foods soaking in it. Some chefs advise slicing off the green leafy top and standing the pineapple upside-down on the cut end for half an hour. This lets the sweeter juices on the bottom travel to permeate the rest of the fruit for a sweeter overall end product. The tough core that is usually discarded or pressed for juice can also be sliced lengthwise and used as stirrers for fruit drinks. Pineapple Upside-Down Cake is a favorite American dessert; try it the next time you want to make a flavorful, summer dessert. Sweet and sour recipes often use pineapple chunks or juice.